These are the two main logos for the Portland Squatch. 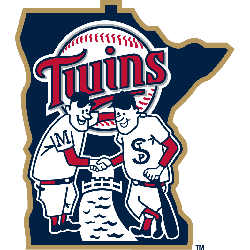 The badge logo showcases the two fonts used for the concept. A script font with a beautiful “S” and then a fairly round san serif font to complement the flowy script “Squatch.” The main element to this design is the Sasquatch with a bat silhouetted against the moon that is stylized to look like a baseball. This logo is designed to reflect the mystery of a Squatch by showing him how he is often depicted, a dark looming figure with little specific details. 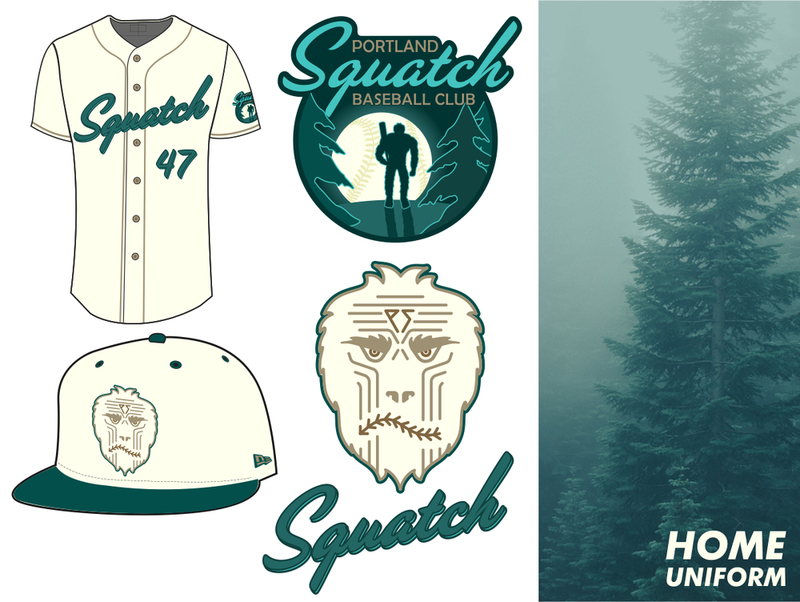 The logo on the right is a stylized Squatch face that will primarily function as the hat logo. This logo was a blast to make as I was able to bring my own style into what I think Squatch should look like. There is no “correct” way to depict a Sasquatch and I think that my line-based design with the baseball seam mouth stands on its own while still doing justice to how the beloved mythical figure is usually depicted. Very few teams have cream jerseys and only one has it as their primary home jersey. 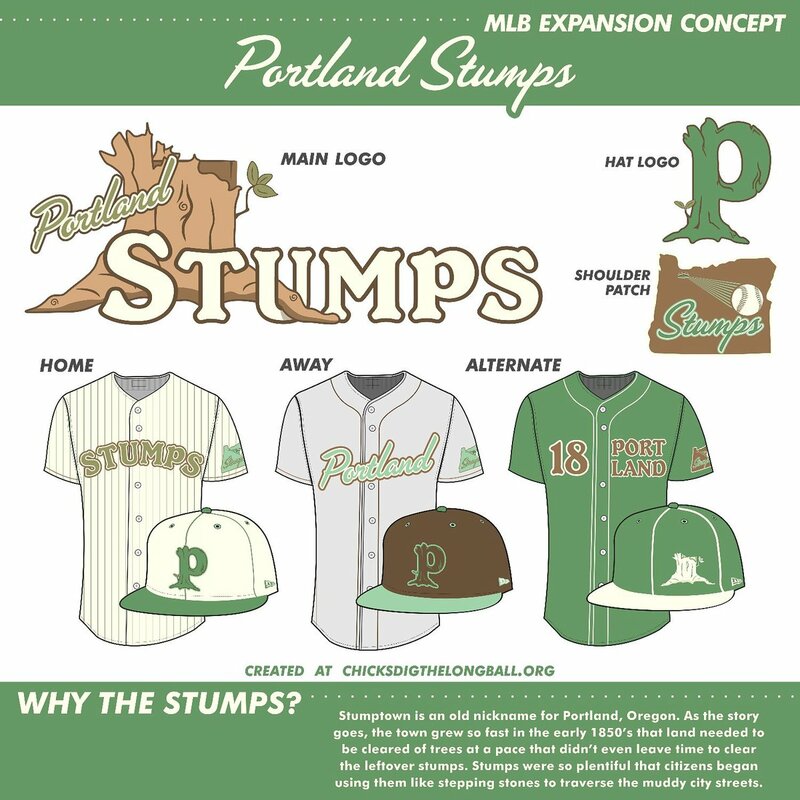 It feels more earthy and old school than the more common white uniforms and as you can tell from me using cream on these and with the Stumps, I think it fits the city of Portland perfectly. 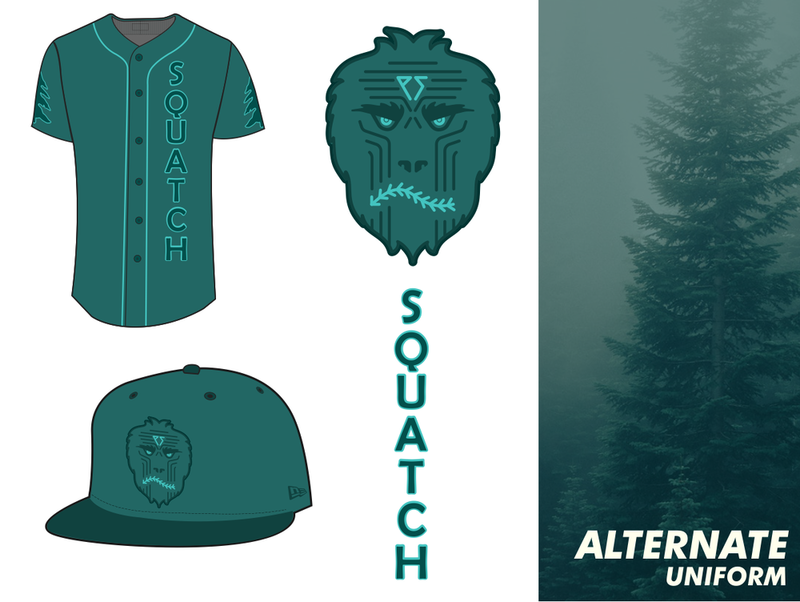 The home set combines the two main colors of the Squatch brand(brown and green) that are each featured more exclusively on the road and alternate uniforms. This brown and cream road set really stands out as a unique uniform. In 2018 only 13 games, out of thousands were played with a brown uniform. It’s typical, but not required, for a road uniform to be grey. My goal was to make a road uniform work without grey. I think brown gets the job done as it’s also a muted color and it won’t interfere with any teams home uniforms across MLB. The lowercase chest lettering is a nod to a style that the Portland Trail Blazers have used over the years and it really sits well on the brown. As for the hat, I love the Squatch face in the brown colors and this cream hat looks great with the brown tops. The alternate is always a good place to get a little bit weird. I really wanted this one to feel like a dark pacific northwest forest. Three different green hues make up the jersey and even the squatch face implements these colors. The seams, eyes and “PS” really shine with the brighter teal color. The vertical lettering is unique among major league uniforms and might be too weird to be accepted. Will it still look good when worn in a game? It’s worked in this town before. I believe Squatch is a name that will be ridiculed far less than my previous concept, the Portland Stumps. At the very least, I shouldn’t have to deal with people telling me “a tree stump isn’t intimidating,” as if that’s some sort of prerequisite for MLB teams. Squatch probably requires less defense but I still think it’s worth explaining my rationale. First, and most importantly, I love Sasquatch. The mystery, the fear, the stupid Animal Planet show. Give me all of it. He(she?) is the best fake animal that American culture has to offer and that demands sports recognition. Secondly, Sasquatch has deep roots in the Pacific Northwest. This beautiful map shows the location of reported Sasquatch sightings and you can see how many of those are concentrated in the Pacific Northwest. Regardless of whether those sightings are real or not, it’s clearly a big part of Portland’s culture. Whether it’s a “gone squatchin” bumper sticker, a brewery or an advertising agency, I can’t drive home from work without seeing Sasquatch. Perhaps there will soon be a new Squatch icon common in the Portland area.